All praises and thanks be to Allah SWT. Abundant salutations be upon our beloved Nabi Muhammad SAW. 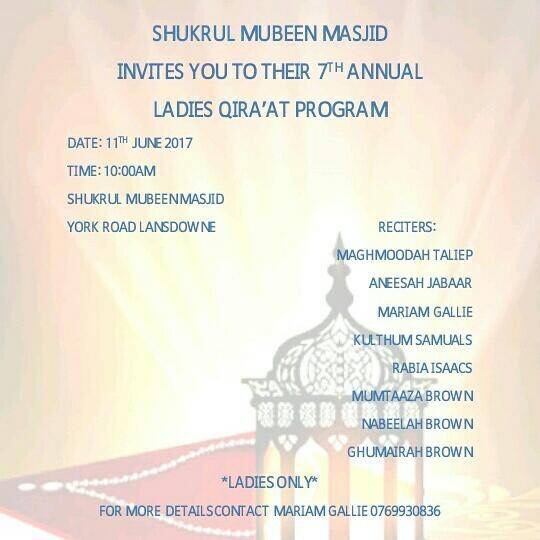 I was invited to be a guest speaker at the Shukrul Mubeen 7th Annual Ladies Qira’at Program. I didn’t actually know about the program, as Mu’alimah Mariam Gallie messaged me on Facebook, but I didn’t check my messages until yesterday afternoon. If one of my friends was asked to speak she would have definitely declined, because her temperament requires lots of time to mentally and spiritually prepare. My spontaneous nature on the other hand didn’t think twice, even though I had little idea what I was going to speak about until shortly before it was my turn to address the audience. I made du’a to Allah SWT to guide my words. So after an elaborate introduction, which made me feel uncomfortable, instead of speaking about what I had spent time preparing, I shared my story of becoming a haafidha. At high school I was an ordinary teenager, with big ambitions to study business and become a success: to be wealthy and live the life. The materialistic life of a corporate career, fancy shmancy car, house, overseas holidays, handsome bae and 2.5 children. I was 17 years old. I had just matriculated and was on a gap year before I was to start university. The year was 2011. The date was the 2nd of March – My teacher Ml. Radia Bawa’s birthday. Our class threw a little surprise party for her. Her mother, Ml. Hajir spoke about their hifth journey and not merely encouraged us, but urged us to make the intention to memorise the Qur’an. So I did. And the rest is history. So I urge you to make the intention to memorise the Quran. I never truly appreciated Ramadan and tarāwīh salaah until I memorised the Quran. Okay, when I said that the rest is history, I didn’t quite mean that. I was just being a bit dramatic. But what is noteworthy is how ALLAH facilitates for you. I didn’t think about the decision. I didn’t make istikhara about it. I didn’t discuss it with my parents. Sometimes we think, I don’t have transport, I don’t have money, I don’t have the brain capacity to memorise the Qur’an. Stop. The intention is upon you; the facilitation is upon Allah. At that same gathering, one of my classmates, Sister Najwa, told me about the hifdh schools at Masjidul Quds in Gatesville. I came home and told my mom that I want to start hifdh. We went to the masjid. I asked someone where the hifdh school was and I was directed to Ml. Mariam Londt. I had no idea who she was. My mother paid my registration fees and Ml. Mariam gave me a copy of Juz 30 recited by Sh. Ismail Londt. I had no idea who he was. (I came from a different world). But the point here is that there was effort made. Sometimes we make the best of intentions but don’t put in any effort. Back to my story, she said something to the effect that she’ll check my recitation and I’ll start with learning to recite if it’s not good enough. I really didn’t want to be put back. She made me recite the first page of Surah Baqarah, which I recited fluently only because my mother used to recite it in the car growing up. So she said I could start memorising the next day. SubhanAllah. If she asked me to recite anywhere else, I would have struggled. I looked for a 15-liner mus-haf (because that’s what Ml. Hajir recommended) and I found a colour-coded 15-liner. Colour-coded 15-liners aren’t readily available in South Africa but I found one – in my home. I needed a colour-coded one because I knew nothing about tajwīd at that point in time. A few short years later, I have memorised the Quran, with understanding, and I’m a teaching the Quran, Alhamdulillah. The Prophet SAW said that Indeed Allah has family amongst mankind. The people of the Quran are the family of Allah and His chosen ones. You’d have to be crazy not to want to be of the family of Allah. So my message is to take one step towards Allah, and He’ll take ten steps towards you.